Today we celebrate Veterans Day. I live near the parade route. throughout the day besides lots of marching bands and bag pipes Veterans of all ages, race and gender will march. I will be there to support those who chose to fight in war. This sculpture is a truly stunning tribute to America's veterans for Veterans Day. The stone pillars in Anthem, Arizona, are calibrated to achieve maximum emotional and visual impact: The sun only highlights the Great Seal of the United States at 11:11 a.m. local time on Nov. 11. By Matt Saccaro On Veterans Day, you might be looking for something a bit more meaningful than just a $2 "support our troops" bumper sticker or lapel pin. 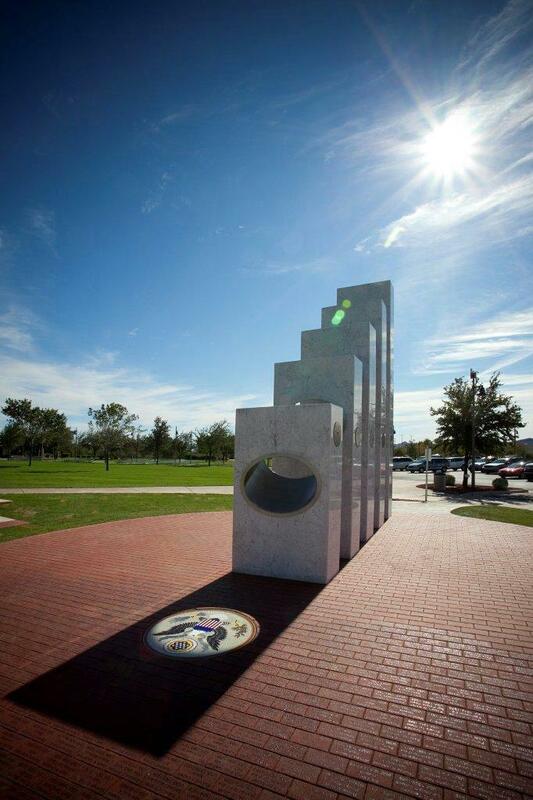 How about this series of stone pillars in Anthem, Arizona, that's calibrated to achieve maximum emotional and visual impact — the sun only highlights the Great Seal of the United States at 11:11 a.m. local time on Nov. 11 — on Veterans Day. For those who don't remember history class, that was the day the armistice bringing World War I to a close was signed. A rear admiral by the name of Ron Tucker conceptualized the idea, and an artist named Renee Palmer-Jones brought it to life in 2012. To add even more gravitas to the monument, the bricks contain the names of 750 American war veterans. To have watched the parade with so many women vets, injured vets, all proud vets. Vets from the Coast Guard, National Guard and all branches of what we could consider the usual branches of military. Now we have drones and NSA spying to protect our freedoms, the unusual the norm. In an ongoing never to end war on terror, how can you stop a war on terror with Terror? This is not the America I believe in. I grew up in the Vietnam generation, the Nuclear Age before the Age of Aquarius, learning to use song and activism to stand up against a government, against a ideal that I don't agree with or understand. Today I'll be standing along 5th avenue applauding those veterans of all races and gender. It's theirs to celebrate, their survival, their aliveness. Let the sunshine in. Let the sunshine in.